Shortly after 9/11, Homes for Heroes, Inc. was established as a way to give back and say, “Thank You” to local heroes for all they do. Our mission is to provide extraordinary savings to heroes who provide extraordinary services to our nation and its communities every day. Hero Buys a Home: Hero receives a check from Homes for Heroes in the mail. The amount is 0.7% of the purchase price of the home, e.g. $1,750 for a $250,000 purchase. Hero Sells a Home: Hero receives reduced real estate service fees. 25% discount on the listing agent’s commission. Hero Finances a Mortgage: Hero receives reduced lending fees. Hero Purchases from Business Affiliate: Hero receives special hero offers. Our network of Business Affiliates includes national brands such as Target, Under Armour, Carhartt, Columbia, and Home Depot. It also includes local businesses that provide moving services, security systems, legal services, home inspections and insurance, etc. Since its inception, Homes for Heroes has given back over $27,000,000 to over 15,000 heroes. The Homes for Heroes Foundation is a charitable nonprofit helping heroes in dire need as it pertains to housing or emergency financial assistance. 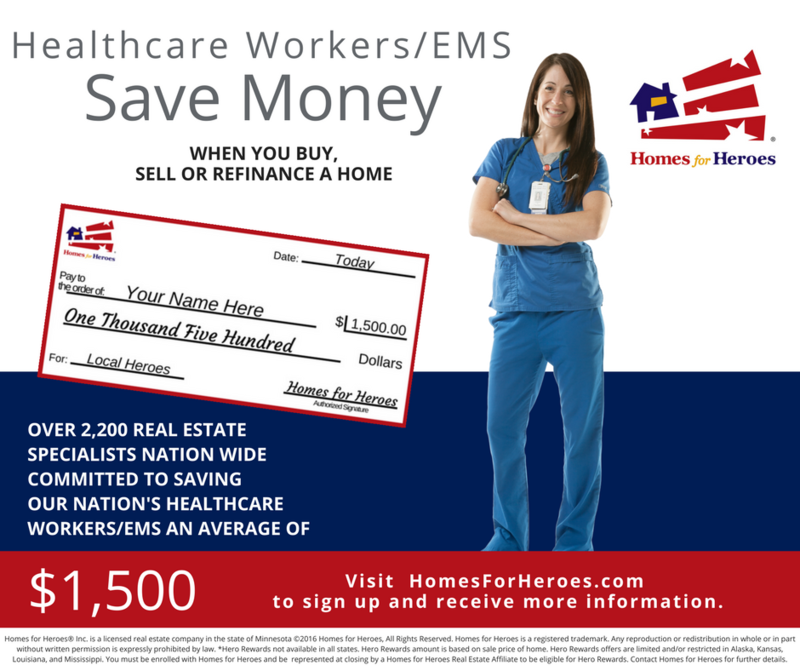 Homes for Heroes, Inc. donates a portion of its earnings to the Homes for Heroes Foundation. So, every time heroes buy or sell a home using the Homes for Heroes program, they are helping heroes in need. The Foundation awards Grants to local nonprofits nominated by Homes for Heroes affiliates. Since its founding in 2009, the Foundation has awarded $400,000 to help heroes. “We’re committed to giving back, serving and saying, ‘Thank You’ to our local community heroes because they do so much to make our great community what it is today. With their tirelessly serving and sacrificing for us, we feel it’s just the right thing to do,” says Ron Rank, local Homes for Heroes real estate affiliate in Libertyville, IL. For further information about Homes for Heroes, a direct link to their website is www.RonsHeroes.com.